Our barn spotlight this quarter is a local farm in Versailles, KY - Blackwood Stables. Blackwood Stables offers full service breaking, training, and rehabilitation services. The farm consists of 350 beautiful acres with a six furlong dirt track and a one mile turf course with a one mile all-weather gallop. While developing his facility - owner Guinness McFadden - knew about the quality of LEE and decided to visit our facility. He toured our shop and compared our barn equipment to other stall manufactures. Guinness knew the decision to invest in a high quality product was well worth the long term investment and purchased stalls, end doors along with entrance gates. We had the pleasure to visit the facility to do a video shoot of the barn and property. Some of the great features of this property is the ability to train the horse on one of the many tracks the property has to offer. Both barns, located adjacent to the tracks, feature a traditional Kentucky training barn with practical and functional stall equipment. They are complete 12' stall panels custom designed and manufactured to fit perfectly between each post. All rolling hardware for the sliding stall doors are top quality pre-galvanized material with powder coating atop to finish out the sleek look. 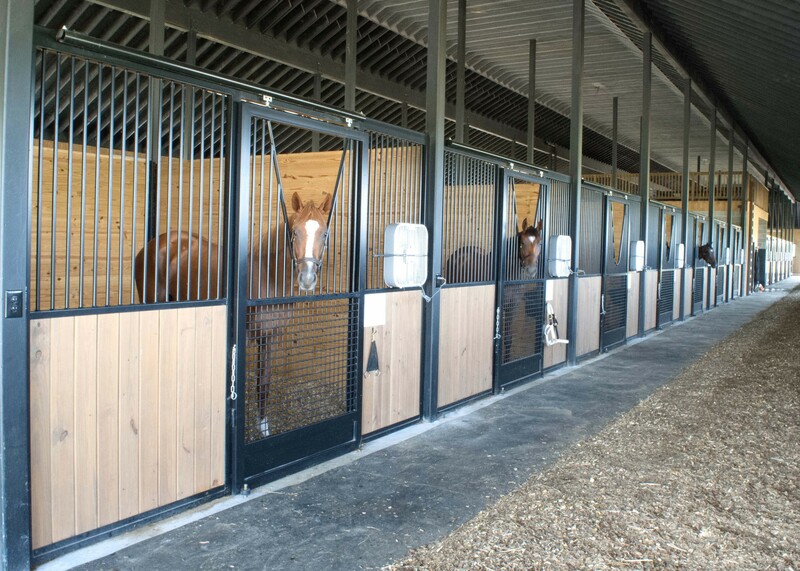 The airy stall design allows great ventilation that is ideal for keeping the horse cool and calm. As you can see in the image below, it is extremely easy to examine the horse inside the stall while not entering the stall yourself. A bonus feature to this high stall front system is the v-yoke opening to allow the animals to communicate while keeping them contained safely in the stall. We would like to thank Guinness and his staff for allowing us to be apart of this great project. If you would like to feature your barn and Lucas Equine stalls in the next barn spotlight please let your sales staff know. Click on the Link to view the drone video.